All Portland homes currently listed for sale in Portland as of 04/19/2019 are shown below. You can change the search criteria at any time by pressing the 'Change Search' button below. "Must see this condo and views to believe it is real. There is no condo or view comparable in all of Portland. Almost 360-degree views. Condo was purchased as two condos and custom designed to become one prior to the building being built. Custom sound and AV throughout condo. The two kitchens, bar, and layout make it an entertainers dream. 3 decks with views across Portland." "Historic classic in the heart of Portland. Designed by acclaimed architect Albert E. Doyle in 1918 for James Cobbs. Amid 2 acres of pristine lawns, peaceful gardens, a Japanese teahouse, swimming pool, sport court and reflecting pond you will discover this iconic masterpiece. Four floors of unique and exceptional living spaces. Extraordinary. [Home Energy Score = 1. HES Report at https://api.greenbuildingregistry.com/report/pdf/R271322-20180510.pdf]"
"One of a kind Penthouse with hand-selected custom finishes throughout. Inspired by the Italian countryside, The Metropolitan Penthouse features sublime mountain, river, forest and City views. The generous 3,495sf floor plan offers large gathering spaces and nearly 800sf of outdoor patio space. A true gourmet kitchen overlooks the living spaces and features custom marble countertops, Sub Zero, Wolf and Asko Appliances. LiveAbovePortland." "Iconic historical beauty located in the heart of Portland's esteemed Dunthorpe neighborhood on 1.5 acres. Dream entertainer exudes the elegance & charm of yesteryear w/fully updated systems & infrastructure. Gated estate offering privacy & picturesque level sunny grounds w/space for pool,tennis & more.Wonderfully set up for live-in/guests w/separate suite area.Handy location just minutes to downtown, Lake Oswego & more.Riverdale Schools"
"Exquisite Elliott Corbett Estate, offered for the 1st time in a quarter of a century in exclusive Dunthorpe. Private site w/stunning pool, long drive, glorious gardens & outdoor terraces. Tastefully & elegantly appointed, updated & pristine, yet comfortable. Counter-plays of light emanate from French doors & true divided light windows. Expansive hardwoods, high ceilings & superb craftsmanship. A rare offering. Coveted Riverdale schools"
"Gated Gamble style Estate in Dunthorpe. Resort style outdoor living spaces with custom-designed landscape pool & garden filled with picture-perfect Hand crafted materials and finishes. Completed in 2011, 4 bedrooms with details inspired by Greene & Greene designs. Beautiful custom millwork thruout. Master suite on the main with exercise studio.rich woodwork, nature-inspired stain glass and hand-stenciled designs." "Magnificent Modern in the heart of Dunthorpe. Built in 2015 & recently renovated this incredibly private estate has everything today's discriminating buyer could ask for: gourmet kitchen w/great rm w/walls of glass that open to the pool, hot tub, covered outdoor kitchen & fire pit, main floor master w/new spa like bath/two large walk in closets, new 1000 SF man cave w/automatic sliders that open to the courtyard fire place/H20 feature"
"A tale of two eras defines the essence of this West Hills Estate. Step inside& experience the youthful edge of years of meticulous renovations culminating in the harmonious blend of Portland 2018& East Coast classic living. Rich in detail& tradition yet modern in floorpan, design& construction creates the best of old& new. 1.34 acres of balanced gardens, verandas, swimming pool & open air spaces. Ideal for entertaining and lives simply." "One-of-a-kind Portland icon, Blackberry Castle, on 6 acres with vineyard & underground wine cellar. Five bedrooms, 13,000 sq. ft. built in 2008 with incredible 2 story turret library, European village-style atrium bar & entertainment space, and home theater. Fully-equipped home gym with climbing wall, home spa with sauna and luxurious master suite. Entertainer's kitchen with deluxe appliances and huge central island in open great room." "Contemporary home & the ultimate entertainer w/pool, spa & tennis court! Perfect for the active lifestyle. The main level lives spaciously w/a great room, gourmet kitchen, guest suites, media area & the master suite that features 2 wi-closets & spa like bath. Great flow of space w/lower level kitchen & bar w/outdoor access to all the amenities like: heated outdoor BBQ area w/fireplace, pool house, zen garden, meditation & exercise room." "Historic JC Braley house listed on the National Registry of Historic Places is an exquisite representation of the Georgian Colonial Revival. The breathtaking panoramic views of Mt Hood, Mt. St Helen's, Willamette/Columbia rivers and downtown Portland are showcased by this special home. Renovated by an award winning designer this exceptional property provides a unique opportunity. Truly a must see." "Enjoy a life defined by what is special, graceful, stylish and smart in this renovated Council Crest estate. A perfect blend of period details, contemporary design and amenities, this residence is designed for living outdoors as elegantly as indoors. Expansive stone patios are set within a landscape designed to capture a chorus of blooms year round. This spacious urban retreat is located close to parks, trails, the city, NW 23rd & OHSU. [Home Energy Score = 1. HES Report at https://api.greenbuil"
"Spectacular custom villa on the Columbia. Exclusive waterfront property features private dock (up to 60ft yacht). Dine with doors open to serene river views.Entertain in glassed-in indoor/outdoor living room w roll-up garage door. Chefs kitchen, custom woodwork, metalwork throughout. Elevator to 3 floors. 6 car garage. Close to golf courses, yacht club, airport. See feature sheet of custom selections for this magnificent property." "Chance to own Bella Organic on Sauvie Island. A 97.2 acre farm with organic U-pick, Winery, Cidery, & Agri-tainment. Includes 5000 sqft grocery store, 8 acres of blue berries & other berries & fruit trees. 3 additional outbuildings, manufactured home, water rights, irrigation equipment, and Farm Stand Permits. Has a rare build-able waterfront home site on the Willamette"
"Historic Dutch Colonial Revival in stately Eastmoreland across from Reed College. Designed by Portland Architect Bruce McKay and extensively renovated to maintain the homes historic significance while updating for 21st Century living. This exceptional property enjoys a.575 acre space with beautiful gardens in a park like setting that can be enjoyed from the large windows. A unique opportunity in this close in neighborhood!" "Vista condominiums now ready for occupancy! 21 stories of contemporary living. 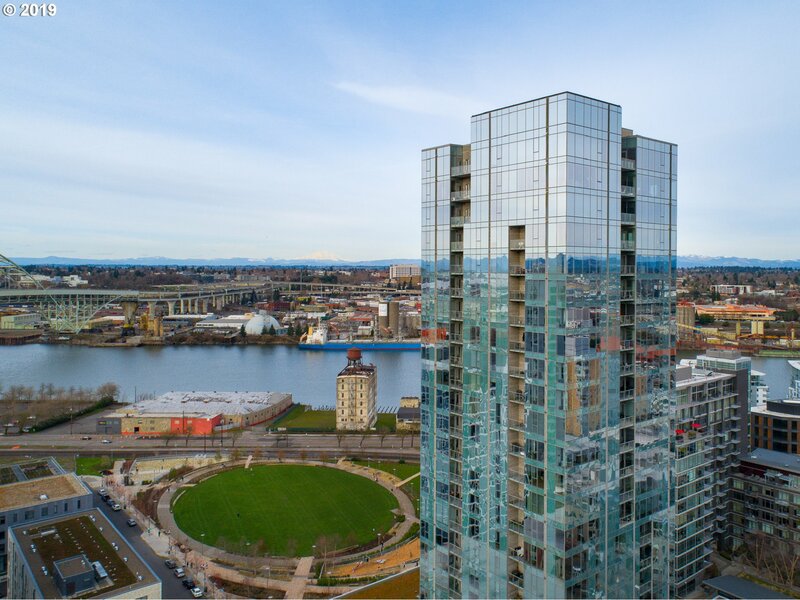 Only NEW condo construction in the Pearl District for sale. Daily concierge & nightly security, fitness room, dog wash room, community room, meeting room, two guest suites, courtyard overlooking The Fields Park w/fire pit. 2 stunning lobbies w/exquisite finishes. Deeded pkg & stg. Actual unit finishes may vary. Make an appointment to tour the Vista today!" "It's unbelievable! A 40ft+ vaulted steel commercial frame and nearly 3 acres customized to be a personal playground. So what's possible to transform this amazing property? Zoning allows 7-9 units per acre with various conditional uses like attached homes, an event space, retreat center, group care, bed-n-breakfast, with potential for more. Call and tour today - it's 100% worth your time." "Vista condominiums now ready for occupancy! 21 stories of contemporary living. Only NEW condo construction in the Pearl District for sale. Daily concierge & nightly security, fitness room, dog wash room, community room, meeting room, two guest suites, courtyard overlooking The Fields Park w/fire pit. 2 stunning lobbies w/exquisite finishes. Deeded pkg & stg. Make an appointment to tour the Vista today!" "Proposed new construction. Lot is available at $350,000.00 HOA dues TBD when built." "Fall in love with this proposed classic modern farmhouse on this stunning 1.5 acre property located in the heart of Portland's esteemed Dunthorpe neighborhood.Gated estate boasts exceptional privacy & amazing outdoor living areas.Sleek design offers great room floorplan w/open airy spaces & exceptional finishes.Option to create your own custom design.Space for pool,casita & much more. Handy to vibrant PDX & Lake Oswego's many amenities." "One of kind with south/east/west exposure from the Vista 19th floor! This gorgeous penthouse features 11' ceilings, Wolf & Sub Zero app., beautiful light European hardwood flrs, gorgeous limestone bathrooms, fireplace, laundry room w/storage, 2 master walk-in closets and more. Stunning natural light fills this truly unique penthouse unit. A must see! 2 side-by-side parking sp. 1 storage inc. Call for a tour today." "Historic Walter V Smith residence on .52 acres with private drive sited high above the street in the heart of the grid in Portland Heights.Inspired by British Craftsman influences;fine detailing,refined aesthetics and simplicity.Broad shouldered w/open floor plan/soaring ceilings/light-filled. magnificent landscape designed by Barbara Fealy, sweeping level lawn,multiple gardens,patios and porches. Lower level sqft is unfinished/storage. [Home Energy Score = 1. HES Report at https://api.greenbuil"
"Exquisite architecturally designed Traditional with stunning living spaces inside & out. Remarkable updates include addition of 2000+ bottle wine cellar, an indoor/outdoor sun room with accordion doors to patio providing year round entertaining & spa master suite with dual steam shower & large walk-in closet. Re-imagined & remodeled lower level. Astounding craftsmanship and quality of materials will impress as no detail was overlooked! [Home Energy Score = 2. HES Report at https://rpt.greenbuild"